With a population just less than one million, Cologne is Germany's fourth-largest city, after Berlin, Hamburg and Munich. Cologne lies on the River Rhine and is one of the oldest cities in Germany, having been founded by the Romans in the year 38 BC. 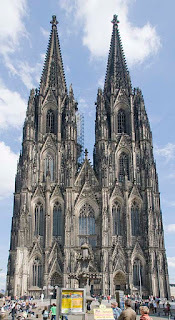 The famous cathedral is the largest in Germany. Slideshow here.Cologne is also famous for Eau de Cologne, created by an Italian expatriate Johann Maria Farina early in the 18th century. As the fragrance gained popularity, a merchant named Wilhelm Mülhens negotiated the right to use the name Farina, and promptly opened a small factory in Glockengasse. Like oth er "hot item"agreements, this one ultimately ended up in court, at which time Wilhelm's grandson Ferdinand Mülhens renamed the product 4711, the house number of the factory in Glockengasse. Both products are still made in the city to this day. Carnival season is another Cologne biggie, beginning each year on 11 November at 11 minutes past 11 a.m. and continuing, for an entire 3 months or so, until Ash Wednesday. Things apparently really amp up during the last week, when the street carnival starts, it is claimed, with as many as a million people celebrating in the streets on the Thursday before Ash Wednesday. Backstory here. The landmark cathedral was started in 1248, abandoned around 1560 and finally, finished with a flourish in 1880, to become a German national monument celebrating the newly founded German empire. During the final throes of completion - after 600 plus years of foot-dragging - a large amount of historic heritage was simply torn down, including the city walls, to show the building at its best. 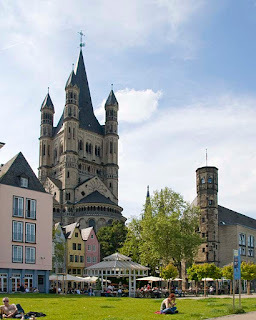 During World War II, Cologne was a Military Area Command Headquarters and sustained 262 air raids by the Allies, causing almost 20,000 civilian casualties and effectively razing the city center. During the night of 31 May 1942, Cologne was visited by "Operation Millennium", the first 1,000 bomber raid by the Royal Air Force. 1,046 heavy bombers dropped 1,455 tons of bombs on the city in 75 minutes, killing nearly 500 civilians and rendering a further 59,000 homeless. In 1947, architect Rudolf Schwarz produced a reconstruction plan which took advantage of the sparse remnants of th e city center by including several new thoroughfares designed for anticipated automobile traffic. The project also called for the eradication of more than a dozen historical churches and other architectural treasures, exacerbating the destruction of heritage begun in 1880. The reconstruction finally took almost 50 years.The cathedral, officially Hohe Domkirche St. Peter und Maria, is a World Heritage Site and one of the most recognized architectural monuments in Germany. 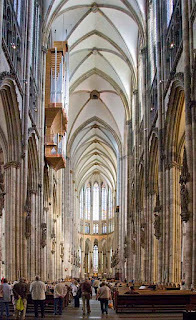 At 478 feet long, 280 feet wide and with two towers, each 520 feet high, it is the largest Gothic church in northern Europe and has the largest facade of any church in the world. For a few years, it was also the tallest structure in the world until being bested by the Washington Memorial in 1884. Arnhem is on the Lower Rhine and, since our route into Germany more or less followed the river upstream, we decided that this was our plan and we would follow it further to see where it leads. 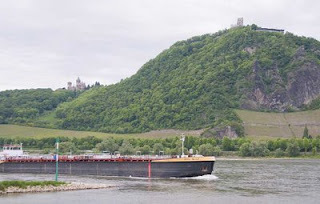 The Rhineland is a pretty big chunk of western and north-western Germany and only fell into German hands in the early 19th century following one of the collapses of the French Empire, to which it belonged at the time. The southern part is Rhineland-Palatinate while Rhineland-Westphalia is to the north and is the part that borders on the Netherlands. Westphalia includes the Ruhr Valley, the highest population density area of Germany. By and large, this area is the epicenter of the German economic machine and not a particularly popular tourist region. Our journey through the area was somewhat skewed by poor weather but nonetheless, thoroughly enjoyed. 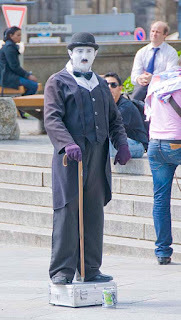 We didn't do any walkabouts in the cities along the way mainly because those we looked at had been massively spoiled during WWII and were redolent of hasty, low-cost, post war construction. We did however, continue improving the creature comforts of Penny and generally settling in to our temporary lifestyle. 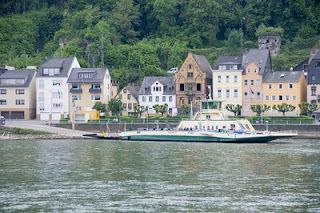 Checkout the Backstories on the Essen and the Cologne campsites and how to pass an inclement climate day in Deutschland. 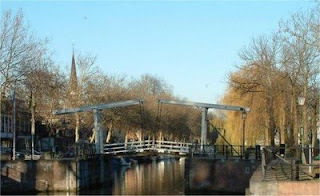 The title of the 1977 WWII movie, A Bridge Too Far, actually refers to the bridge over the River Nederrijn (Lower Rhine) in Arnhem, Netherlands. Specifically, the name comes from a comment made by British Lieutenant-General Frederick Browning to Field Marshal Montgomery, the operation's architect, "I think we may be going a bridge too far." The film approximates the story, and ultimate failure, of Operation Market-Garden, the Allied attempt to break through German lines in September 1944. Despite (or maybe because of) a stellar cast including Dirk Bogarde, James Caan, Michael Caine, Sean Connery, Denholm Elliott, Elliott Gould, Edward Fox, Gene Hackman, Anthony Hopkins, Jeremy Kemp, Laurence Olivier, Robert Redford, Liv Ullmann, Maximilian Schell, Hardy Krüger and Ryan O'Neal the movie was a ho-hum performer at the box office. An earlier (1946) movie, Theirs Is the Glory, covering the same events, was cast mainly with people who had been involved in the operation and mixed newsreel footage from the actual battle with re-enactments shot on location in Arnhem. 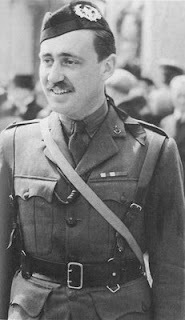 John Frost, the British airborne officer and first Allied combatant to arrive in Arnhem, was one of many who played himself in the earlier movie. A thoroughly despicable consequence of the operation's failure was the Hongerwinter (Hungerwinter). In retribution for Dutch railroad workers aiding the allies during the assault, Germany forbade food transportation into the region, utimately starving thousands of Dutch citizens to death. Anyway, enough cheery banter; time to winge on about Arnhem, 2009. At 114,000 population, one of the largest cities in the Netherlands, there did not appear to be a lot going on. Much history of course, was lost in WWII and, outside of a few run down churches and a collection of hideous sculptures, there is little to Ooh and Aah at. Slideshow here. The post-war utilitarian bridge that replaced the one destroyed in the war, was renamed John Foster Bridge in 1978 although Foster modestly objected. Having seen the bridge he should perhaps, have been more assertive. Campsite Backstory, Arnhem Backstory. At 16,000 square miles, the Netherlands is about half the size of North Carolina and is home to 16 million people - somewhere between the population of Florida and Illinois. Geographically, it is a low lying country with large areas claimed from the North Sea. More than 10 million of the inhabitants live in the 27% of the country that is actually below sea level. It is not true that windmills are Dutch attempts at helicopters. Today, there is serious stuff to do. Must get propane cylinders, shore power cord, big red sign for the bike rack, a roll of anti-skid material for the table and chocolate. As it turned out, all was accomplished with great ease in the suburb of Nieuwegein and we began to feel really secure in our little van, especially now we had chocolate. Although this picture is from Nieuwegein, they had hidden the nice part from our view. Nine weeks, eight countries, countless baguettes, three thousand miles of motoring, 250 miles of cycling and 160 of walking, we arrived home from Europe in denial of some serious weight gain. But, what are treadmills for, if not for taking the smile off one's face while prepping for the next outing :o( Meanwhile, we have about 8,000 photographs to organize and connect with the sixty or seventy cities and sights we had the pleasure of visiting, so at least we have a valid reason for lounging around enjoying the Indiana summer.